Cabe must pass a physical fitness test now that he is working legally again. Paige is going to help him with her regimen. Cabe isn’t happy. Toby and Happy arrive, back from their honeymoon. They have a new job assignment working for Safe Corp. They need to check their bunker. They don’t want Toby on the job though. But Flo has been invited. Toby goes crazy when he hears this. Paige invites him to stay behind with her and Cabe. Paige and Toby talk about the honeymoon. It didn’t go so well. They got a flat, it rained the entire time and their ocean view wasn’t a view at all. On top of that, Toby couldn’t perform, he confides in Paige quietly. Walt comes in to interrupt. He is upset Toby isn’t going but Flo is. He obviously feels weird after his dream state when he was married to Flo. Walt, Flo, and the others show up at their new job. When they get out of the car they come face to face with Quincy, the man who stole Toby’s fiancée. Quincy is a specialist with Safe Corp. When the gang turns down the job, Quincy doubles their pay. They can’t turn it down. Quincy shows them how to access the bunker that is controlled by a software system named Dorie. Quincy has installed a high tech security system that recognizes individuals by their breath outside the entrance of the bunker. Inside, Quincy gives them a tour of the bunker. Toby shows up unexpectedly. He is mad as hell when he sees Quincy. He rips his scarf off and begins telling Quincy off when Amy, his ex and new wife to Quincy, comes out of another room. The bunker detects Toby and shuts down. Quincy added Toby to the database as an enemy. Now they are all locked in the bunker together. Everyone continues to fight. Sly feels faint. Walt starts dishing out jobs to everyone to help them get out of there. Toby unscrews the maintenance panel while fighting with Quincy. Meanwhile, Walt tells Happy he thinks Amy is impressive which makes Happy not too happy. Sly and Flo work together. Flo doesn’t understand why Walt didn’t want help with the hydraulics, it is her thing. Cabe and Paige show up outside of the bunker. They meet a man who pulls a shotgun on them. He isn’t a fan of Safe Corp.
Something goes wrong. The trash compactor turns on with Toby in there. Quincy tries to communicate with the virtual bunker named Dorie, but she sees Toby as a threat so she will not shut it down. The compactor closes completely. Happy thinks he is dead. She is ready to cry, telling Walt all they did was fight on their honeymoon. Toby yells from the lower floor where he dropped into to save himself. The man with the shot gunzip ties Paige and Cabe in his home. Paige gives him a speech about how she understands that he has been replaced by Safe Corp, by someone younger and how it isn’t fair. He cuts them loose. He shows them how he plans to get into the bunker. He rolls out his plans. And then shows them his impressive computer set up they can use to contact the team. He lets them go after they get what they need. Meanwhile, Walt and Happy see a shaft that they may be able to get out of. Happy and Amy talk briefly while they wait for Paige and Cabe. Amy tells her she shouldn’t be jealous. Dorie interrupts with a Protocol 2 announcement. Walt read the schematics. Dorie plans to spray any intruder with neurotoxins. How will Paige and Cabe be able to get near them? The gang huddles together and talks in a whisper so that Dorie doesn’t hear. They come up with a plan. Happy and Amy end up in the same room again. Amy admits her honeymoon with Quincy was just as horrible. She comes second to his career. Meanwhile, Quincy tries to give Toby some tips about his performance issues. Angry and embarrassed, Toby strips the bolt on a valve his is trying to loosen. Toby talks to Sly – he can stop the gas. He is smart enough. Sly talks to Dorie and tries to trick her. Quincy locks himself in a glass room that can protect him from the gas. He won’t anyone in, including his wife, since there is only enough oxygen for one in there. The team starts brainstorming. If they get Quincy’s breath (some of his gut flora) into a spray can then they can shut down Dorie from the outside. Sly starts asking Dorie puzzles and riddles to keep her busy while they all get to work. Once they siphon Quincy’s gut flora from the room where he is hiding out they give it to Toby who parachutes up the exhaust room. Toby makes it up and out, barely dodging the electric fence and landing on the hood of the car where Paige and Cabe are parked. They race Toby to the front entrance of the bunker where he sprays the air into the security system Quincy created. He demands Dorie cancel all protocols. It works! The team comes out of the bunker. 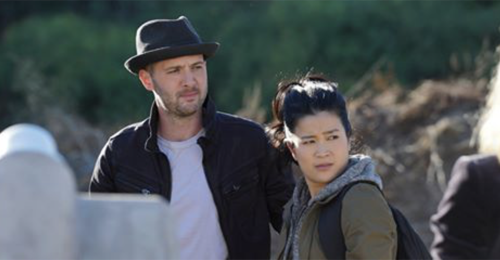 Amy leaves with Scorpion after calling Quincy gutless. Back at the warehouse, Toby talks Walt into telling Flo about his weird dream. He confronts Flo who walks away awkwardly. Toby tells Happy he is sorry he ruined their honeymoon. She is over it and wants to go home to make up for lost time. Meanwhile, Toby tells Paige about his dream. She doesn’t take it well.